FREE onsite estimates for all Charleston, SC moves! These estimates are onsite to see what needs to be moved and the conditions of the move. It is always best to meet your mover, get to know them, and feel comfortable with the company before letting them handle your move. 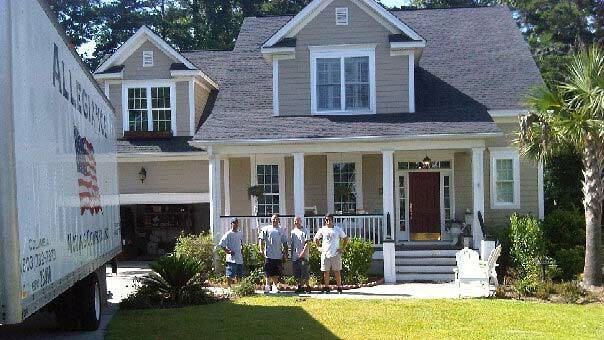 We are a local moving company serving Charleston SC area since 1997. At Allegiance Moving Company, our experience saves you time and money. We cherish our clients and make sure each and every move in Charleton is successful. We strive to provide our Charleston customers with the highest quality move that's why we provide the best moving equipment and materials so that each move goes as smoothly as possible. Allegiance makes it a priority to make sure our insurance, licenses, and training are up to date for our safety as well as yours. Our staff is trained to handle any type of move, this is done through vigorous training on and off the truck. Get your Charleston moving quote now and don't forget to check out our storage options. We've been serving Charleston's moving needs for over 18 years. Locally Owned. Registered, Licensed and Insured in the state of South Carolina. Allegiance Moving Company is a licensed, bonded and insured mover in South Carolina. Allegiance Moving Company, Inc offers moving services in the Charleston, Mt. Pleasant and Summerville area since 1997.